Monsanto to Charge as Much as 42 % More for New Seeds! The biggest study of its kind ever conducted – the International Assessment of Agricultural Science and Technology for Development – concluded that GM was not the answer to world hunger. GM food is all about profit and it kills you. Aug. 13 (Bloomberg) — Monsanto Co., the world’s largest seed maker, plans to charge as much as 42 percent more for new genetically modified seeds next year than older offerings because they increase farmers’ output. “Our pricing has the flexibility built in to ensure the grower captures the greatest return from his seed investment, irrespective of market volatility,” Chief Executive Officer Hugh Grant said today in a statement. Grant is introducing new modified seeds that boost yields as part of a plan to double gross profit from 2007 to 2012. The new soybeans, which resist Monsanto’s Roundup herbicide, produce 7.4 percent more soybeans per acre than the older version. SmartStax kills insects in multiple ways, reducing the amount of conventional corn that must be planted to deter insecticide resistance. “SmartStax pricing is higher than we initially expected,” Vincent Andrews, a New York-based analyst at Morgan Stanley, said today in a report. 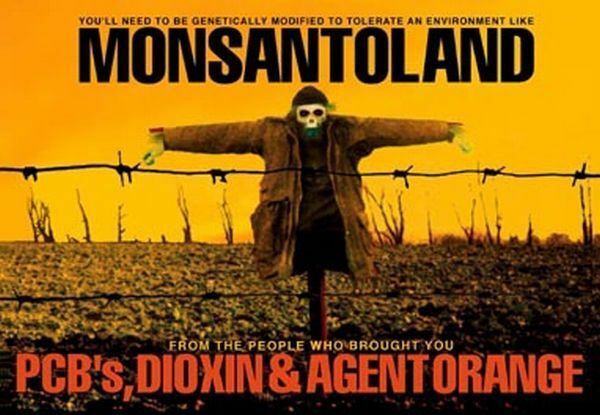 Monsanto rose $1.57, or 1.9 percent, to $84.03 at 4:15 p.m. in New York Stock Exchange composite trading. The shares have gained 19 percent this year. SmartStax corn seed will be planted on as many as 4 million acres in 2010, its first year on the market, with a potential for as many as 65 million acres in the U.S. eventually, the company said. The new seed boosts yields 5 percent to 10 percent compared with other products, partly by reducing the amount of land that must be planted with conventional corn to 5 percent from 20 percent, Monsanto said. Pricing for SmartStax is at the high end of expectations, Laurence Alexander, a New York-based analyst at Jefferies & Co., said by telephone. Roundup Ready 2 Yield soybean seeds were planted on 1.5 million acres this year and will be planted on as many as 8 million acres next year in the U.S. with a potential to one day reach 55 million acres, Monsanto said. The company is pricing its seeds to share the benefit of increased yields with farmers, said Mark Gulley, a New York- based analyst at Soleil Securities. Prices include seed treatments designed to protect seedlings from pests and disease, Monsanto said. Monsanto repeated its forecast for earnings in the fiscal year that ends this month at the low end of a range of $4.40 to $4.50 a share. The average estimate of 16 analysts surveyed by Bloomberg was for profit of $4.41 a share.